Candlestick Kit (takes the place of the candle), with 4" antique gold drip candle cover, candelabra socket, 8 ft. cord set with in-line switch & all U.L. listed components. 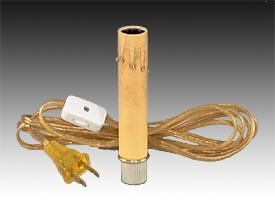 30410 - Candlestick adaptor with 3/4" base dia. 30411 - Candlestick adaptor with 15/16" base dia. No reviews yet for the Candlestick Adaptor w/Antique Style Cover.